Who loves bread? Well, who doesn’t love bread?? For many people, bread is one of those things that is impossible to give up. It’s not only delicious in a comforting kind of way (I’m thinking buttered warm toast here), it is also such an easy and transportable meal staple. Unfortunately, two slices of wholegrain wheat bread will raise your blood sugar levels higher than eating 6 teaspoons of table sugar. You can test this yourself with a simple glucose meter – check your blood sugar between 30 to 60 minutes afterwards. It really is astonishing that we are still being told by our governments that the bulk of your diet should come from carbs and grains. All that’s definitely going to happen when you eat according to the food pyramid is that you end up looking like the food pyramid. Our bodies cannot process all the excess glucose we’re consuming on a regular carb-heavy diet. It gets stored as fat around our waists and around our organs. There are predictions that by 2050 up to 90 percent of the population in the UK will be obese (today it’s 60% of the adult population, 1/3 of the children), and Type 2 Diabetes continues to be on the rise. With wheat and other grains off the table, there still are many ways of enjoying bread when you’re on a low carb diet. 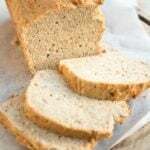 Low carb bread is generally made with either coconut flour or almond flour as a base. I have quite a few recipes on my website using either or both in combination. 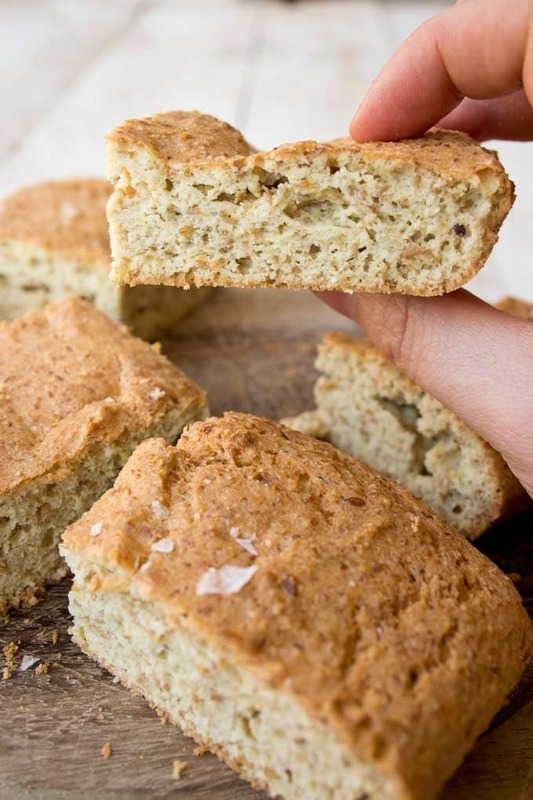 Try my easy low carb rolls, these low carb English muffins or this really rustic Paleo bread, which is packed with seeds. I wanted to create a coconut flour bread recipe using flaxseed, which is super-low in carbs and a brilliant source of fibre. I decided to base it on my low carb roll recipe and after a bit of experimenting I’m excited to share the result with you here. 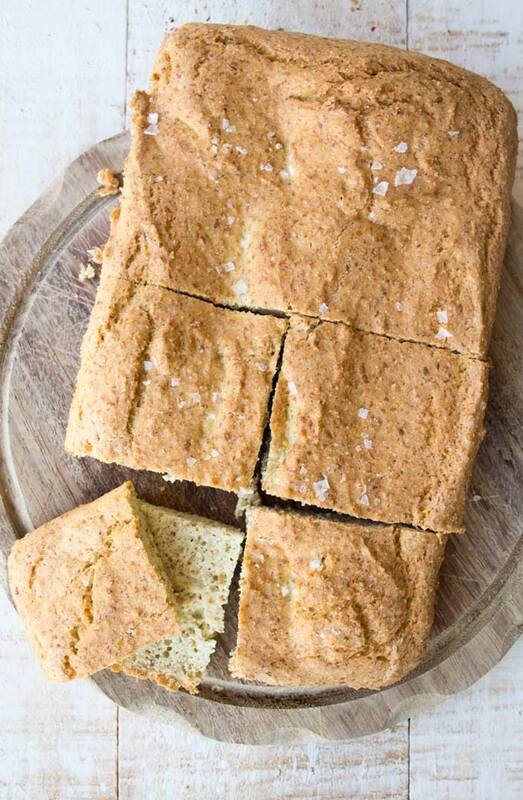 This coconut flour flaxseed bread recipe is delicious, easy and really versatile. 1.) The great thing about this bread is that here’s no need to whisk the egg whites until they’re stiff. You could do it if that’s your thing – it might make the bread even fluffier – but it’s pillowy and soft even without. 2.) Talking about eggs – one of the great things about this coconut flour bread is that it DOES NOT TASTE EGGY. This is because I’ve left out 3 of the egg yolks and used only the whites. 3.) The first time round, I made this coconut flour bread as a Focaccia-style flatbread. Just before I started writing this post I made it again in a silicone loaf mould (yes, I do double-check these recipes work!!). Both work well – as a loaf the bread needs 10 minutes longer in the oven. 4.) I baked my bread Focaccia-style in a 25×15 cm casserole dish. Next time, I will line it with baking paper to be able to take it out easier. 5.) 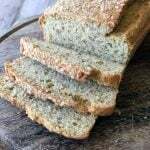 You can even make flaxseed muffins with this bread recipe! In this case, the oven time will probably have to be reduced. My guess would be 25-30 minutes. 6.) I calculated the recipe as 8 portions. These portions are GENEROUS! Flax is very filling, as is coconut flour. 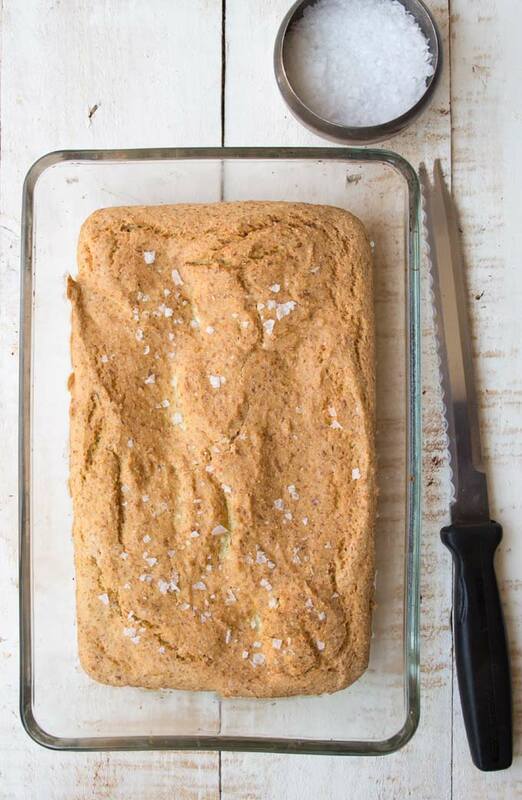 You CAN make this flax bread with almond flour instead of coconut flour. I’d think you would have to use twice the amount of almond flour as it’s less absorbent. In this case, you’d also leave out one of the eggs. You could top your coconut flour flaxseed bread with seeds (I tried sesame seeds, which worked well) or even mix some seeds into the dough. Or you go full-out Focaccia by adding rosemary and garlic on top. I used olive oil in the recipe because I was after a “bread” taste. I think it masks the taste of the coconut flour well, especially in combination with the salt. This way, the bread is perfect for savoury toppings. If you wanted, you could use melted butter instead and have more of a muffin-type taste, which would be good for sweet toppings. A soft, pillowy flaxseed bread that can be baked as a loaf, Focaccia-style or even as muffins. This bread uses coconut flour as a base and is great toasted. Add the rest of the ingredients and blend until you have a smooth dough. Let the dough sit for a few minutes so the coconut flour and flax can absorb the moisture. Pour the mix into a well-oiled pan (alternatively, line a pan with baking paper) and bake at 180 Celsius / 356 Fahrenheit for 35 minutes or until browned on top. It's ready when a knife inserted comes out clean. If you prefer to bake as a loaf, increase the time in the oven by 10 minutes. I baked my bread Focaccia-style in a 25x15 cm casserole dish. Next time, I will line it with baking paper to be able to take it out easier. When you make flaxseed muffins with this recipe, the oven time will probably have to be reduced. My guess would be 25-30 minutes. Nutrition is calculated on the basis of 8 portions (when I cut the focaccia flaxseed bread into squares). These portions are generous! The loaf I made on day 2 yielded 20 slices. When I made the loaf, I used a silicone loaf mould - they are brilliant! SO much better than the regular tin pans. Nothing EVER gets stuck in a silicone mould. It will change your (bread baking) life!! Can this be made in the bread machine? If yes, which setting should be used? Hi, thanks for the recipe. Dont yiu add any sweeteners toyour bread? I don’t think it’s necessary, but you can always experiment with a bit if you’re after a sweet loaf! Thank you for the recipe!! I added some olives and cheese and it was delicious!!! I love the taste and texture. Not eggy. Thanks for the recipe. Good texture but too coconutty to me. I even put in savory flavor of Everything but the Bagel seasoning. (garlic, onion, sesame) If I put more flaxmeal in and less coconut flour do you think I should change the amount any of any other ingredients. I get stomach upset from almond flour. Hi Pat, you can experiment with changing the quantities of the flax and coconut flour, but I would not adjust the other ingredients as well. I added the 5 spoonfuls of oil to the mix, just wanted to check that was right? Love this recipe! 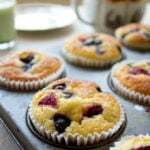 I add 1 tsp of sea salt , make 12 muffins I freeze and pull one out for my breakfast each day. Great with low-fat cheese or natural peanut butter. Thanks! That’s great to hear – thank you for your comment! HI Karin! This bread looks so delicious, I can’t wait to try it! I grind my own flax seed…does it make a difference whether they are golden flax seed or regular? Thanks!!! I don’t think it would make a difference. Happy baking! I tried this last night and oh my goodness! It was delish. I didn’t make a loaf though. I formed them into round buns on baking sheet lined with parchment paper. Excellent!!!! Glad you like it Anja! I’ve never used powdered egg whites, but why not? It’s the same thing 🙂 Let me know if you’re happy with the result! Have made this bread now numerous times and with the egg white powder…..turned out great each time!! Thanks fornthe recipe. Thanks so much for this great recipe! Best low carb, healthy bread I’ve made so far! Wow! I just pulled out my bread from the oven it’s amazing!! Fluffy and tasty! I was inspired by the pics so i loaded it with cream cheese and a bit of salmon with some salt,pepper and a cherry tomato. Heaven. 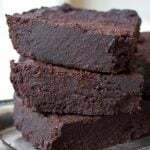 I definitely making this again and try the muffin version, make it maybe a little sweeter with some sort of natural sweetener. Thank you!!. My low carb lifestyle is getting more and more easy. 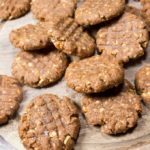 Top marks for taste, ease of making and readily available keto ingredients! This is easily the best tasting keto bread around and doesnt taste eggy or coconutty go figure! 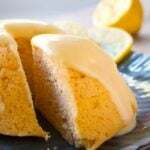 Any plans to make a sweet version of this, I think the texture lends itself well to muffins or cupcakes. Would adding cocoa or sweetners affect the texture? Hi Gerard, it would be roughly 2 slices. My focaccia yielded 8 squares (you can see in the photo), the bread I was able to cut into 20 slices. I made this bread and it turned out great. I used chicken bone broth instead of water and sprinkled in rosemary and sage too. I added a teeny bit of honey as well and cooked it in a cast iron skillet. Even my kids liked it! Really wanted this to work but it didn’t for me… Not sure why. The bread didn’t raise at all. When I mixed the dough it was like a dough instead of the batter consistency Katrin mentioned… I’m not sure if the large size eggs I have are smaller… Anyways when I mix the dough it seemed dry. Wondering would you suggest for me to add extra egg or water or oil? Hi Jo, I don’t think it has anything to do with the eggs. Did you measure the ingredients with either a scale or US cups? That’s always important so you get the quantities right. Also, I find that the bread rises better if the egg whites are whisked until they are firm. That locks in the air and helps it becoming fluffier. If you feel your dough is too dry, I’d add a tbsp of water over oil. How much fiber and Omega 3 are in this recipe? My daughter needs both of these added to her diet..
Hi, this recipe has 6.5g of fibre per portion. My nutrition calculator does not include omega 3 – but the amount of flaxseed I used (flaxseed = 22g of omega3 per 100g) calculated per portion would be 1.1g. This does not include any omega 3 the other ingredients may have. Hope this helps! Could I use chia seeds instead of flaxseeds? Hi, can you tell me how long this bread will keep in the fridge? It’s fine for a few days. I normally slice my bread and freeze it straight away. When I want a slice, I stick it in the toaster to defrost. How many grs is each portion of bread? Is this recipe on my fitness pal? I went wild and experimented based on this great recipe. 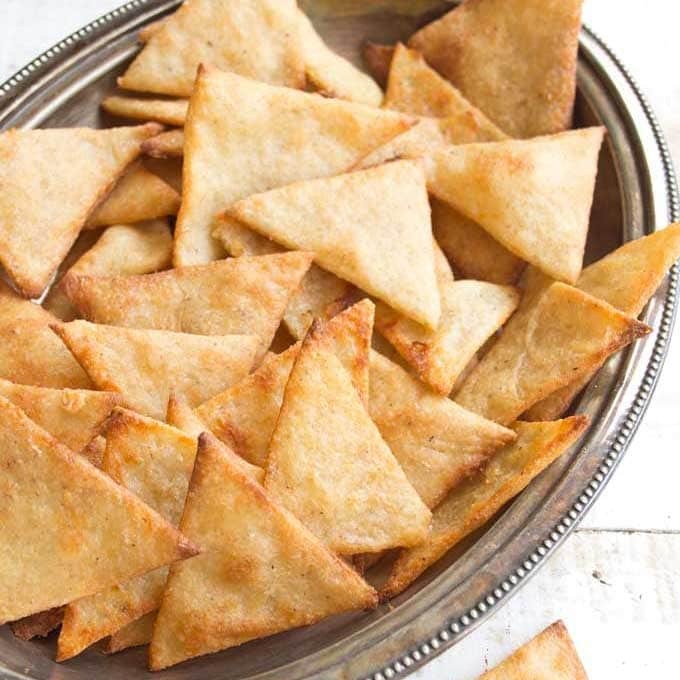 I used half a cup of flax seed flour and half of chickpea flour. I only added 3 eggs, 5 tbs of olive oil and 1 small greek yoghurt, plus the baking powder, ofc. I used a muffin tray, I got 6 of them using the above quantities. They are soooo fluffy and soft and really delicious. OMG I have been trying to find the perfect gluten free bread recipe for 3 years since I fou d out I have the celiac disease. Thank you for inspiring me! I am really happy right now. Premix gluten free flour and premade bread are really expensive but these flours I used only cost like a third of the amount I used to spend. wow, the bread looks so delicious..
is the bread low carb??? yes, it is. You can see the amount of carbs in the nutritional analysis below. I deduct the fibre from the total carbs to get the net carb content. Hope you’ll try it! I didn’t get much of a dough and more of a batter, but all my liquids were correct so I’m not sure what went wrong! One question, I appreciate your nutritionals, but unless I am blind nowhere do I see the serving size…..
Hi Susan, you can find it near the top of the recipe card. The nutrition for this bread is calculated on the basis of 8 servings. This is the best grain free/ low carb bread I have tried, soft texture and really tasty. Thanks for sharing your recipe! Looking forward to trying out more of your recipes. Hi Mel, I’m glad you found my site and that you liked the bread. Have you seen my other bread recipes? This low carb garlic bread is getting really good reviews, it’s made with fat head dough. 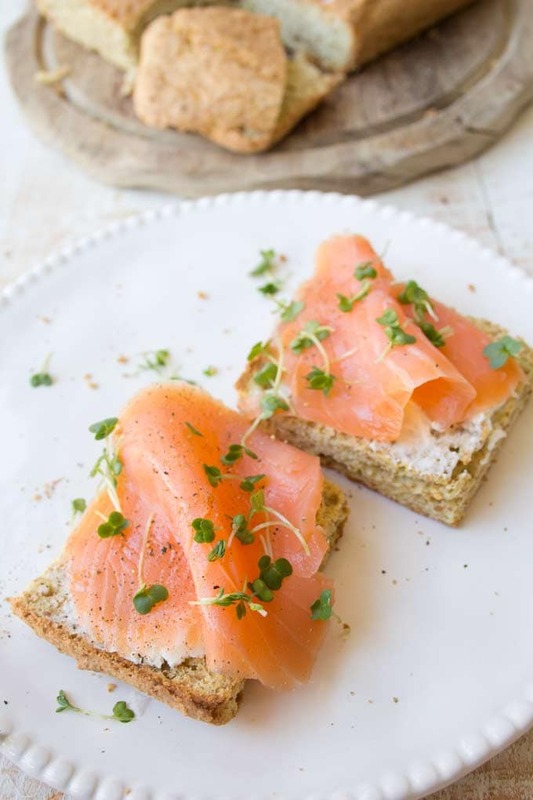 I also love this rustic Paleo bread. The latter reminds me of the rye bread I used to eat as a kid (us Germans are big on dark breads). It’s really dense, you can cut thin slices (not crumbly at all) and it’s superb when toasted. You could definitely try that – I wouldn’t add more eggs, just leave out the other yolks. It would be interesting to see if the coconut flour taste would come through stronger. I’d also consider adding some butter to replace the fat in the missing yolks, or add another tbsp of oil. Great suggestions – thank you! I opened my baking powder pretty recently and its expire date is August 12, 2019, so I doubt that’s the culprit. You may have hit the nail on the head with my oven temp though. I have a thermometer in my oven so I know it runs cold and I typically add 5°F. Maybe that wasn’t enough. I also have the option to bake with convection so I could try that. I’m going to continue experimenting because we both love the flavor of this bread. Thank you! Hi Michelle, when I used a regular size bread mould for mine (you can see it in the picture inside the recipe card) and it was about half the height of a regular bread. So it did not rise massively, but it did come out of the oven taller than I put it in. If yours did not rise that much, I’d first check the expiry date of your baking powder (they do go off and are less effective after). 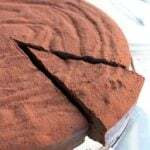 Then you could try the following: You could try adding 1 more tsp of baking powder next time to see if that makes a difference or you could try beating the egg whites to stiff peaks and folding them in last to get more air into the dough. I have no experience with yeast and coconut flour, so cant really advise on that. Let me know if you try any of these and if it makes a difference! So 3 egs plus 3 egg whites or the whites from 3 large eggs? Hi Katrin, I was wondering if the carbohydrates listed in the nutrition facts are net carbs or not – are the net carbs 9.7g or do I need to calculate them myself? eg. 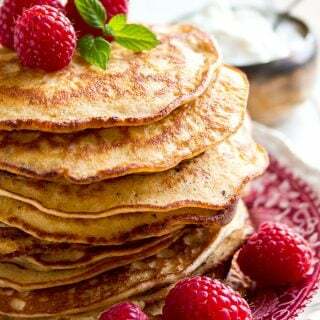 9.7g carbs minus the fibre 6.5g equalling net carbs 3.2g… in all your recipe nutition panels, which is it that you are showing? Many thanks. What would happen if you used the whole egg instead of just the whites? It would work, but it might taste more eggy. Personally, I don’t mind that but there’s always someone who complains about it! This recipe looks amazing. I live in Mozambique and I am now going from shop to shop searching for ground flax seeds so that I can make it!! 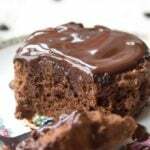 I have made a number of your other recipes and they’ve all been simple to make and so delicious! Thank you. Sadly, I haven’t been able to fin ground flax seeds here. Is there something else that I could use as a substitute? Thank you! Hi Jane, I’m so happy you are enjoying the recipes! If you can get whole flaxseeds, you could grind them yourself. Or is it possible at all to order them online? As a replacement…. it would all be a bit of an experiment. I think ground sesame seeds could be interesting, though I’m not sure if they absorb the same amount of moisture flax does. You’d have to let your dough sit for a bit and see if it has a good consistency. Psyllium Husk is another alternative, though I think you should not use the same amount – half max. The taste is too strong. Maybe half psyllium and half ground sesame seeds? That could work well. Thank you so much Katrin! I eventually found them – they called Linseeds here and I didn’t initially realize they were the same thing as flax seeds! I ground them down myself like you suggested – I used my blender and it worked easily. I just made the bread and it’s delicious!! Thanks for the recipe! Have a lovely weekend. Loved this recipe! The bread is moist and tastes good even on its own. 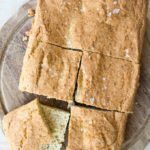 I’ve tried many Keto bread recipes and there’s always something wrong – some are plain disgusting. Normally my family leaves me to eat my own bread, but this time they ended up eating half the loaf! 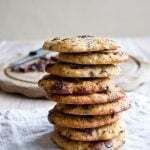 I’ve been looking for a recipe with flaxseed. I have a tree nut allergy, so I was so happy when I found this one!